2016: the year of “we did it”. We expanded to New York City, launched a bicoastal program, and accelerated 12 teams, supported by our growing community. Every year of Matter’s history has ushered in landmark achievements, but 2016 has had more firsts than most. As the entrepreneurs of our sixth cohort (Matter Six) face the culmination of 5 months of hard work — their NYC Demo Day at Google in Manhattan — we celebrate the fact that they aren’t parachuting into the media capital of the world. Matter now has a permanent home on the East Coast. 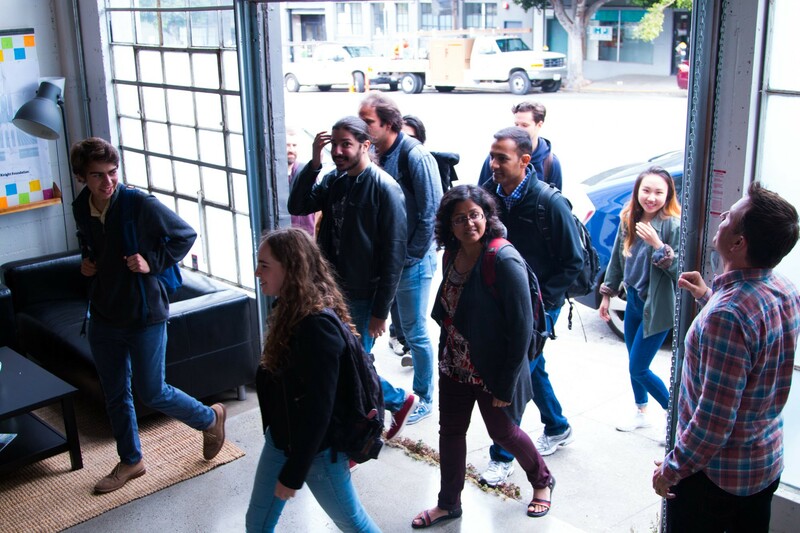 This year we’ve held our first bicoastal program, with six teams full-time in New York City and six teams full-time in San Francisco. We’ve brought them together at strategic points over the past 20 weeks, exposing both cohorts to the rich investor and mentor networks of their sister cities. We had to move at lightning speed to pull off our expansion in just 3 months, helped by the renewed backing of Google News Lab, and with the AP as a safety net. We are proud to say: we did it, and we learned a lot along the way. At its heart, Matter is a community, and without the partners, mentors, and alumni that support us at every turn, we wouldn’t have been able to scale our impact in such a radically short space of time. And as we celebrate our entrepreneurs and their incredible journey from Bootcamp to Demo Day, we also celebrate the many achievements of our portfolio companies and partners this year. In March, our seed company, Parlio, became Quora’s first acquisition, with CEO Wael Ghonim and the rest of his founding team joining the Q&A website. That same month, Matter Four portfolio company News Deeply raised a $2.5m seed round and launched Refugees Deeply, looking at the global impact of the refugee crisis in Europe and the Middle East. We announced in May that we had made our fifth non-accelerator seed investment in hyperlocal news startup, Ripple, led by Razmig Hovaghimian, former co-founder of Viki (now part of Rakuten), and Embrace. We also invested in RadioPublic, a spin-off from our foundational partner, PRX, which is headed up by Matter co-founder Jake Shapiro. Few have done more to advance podcasting than Jake through his work at PRX and Radiotopia. RadioPublic will be the platform that brings podcasts to all the people who don’t listen to them today. Matter Four’s Hearken has had a great year. After winning Best Bootstrap Company at SXSW, they onboarded a slew of new customers (now more than 50 in 10 countries), grew their team (now 9 strong), started a pilot with NPR (on their Goats and Soda blog), launched a new tool (The Interactive Reporter’s Notebook), and teamed up with the Online News Association to collect questions for presenters at their 2016 Denver conference. Matter partner KQED’s Hearken-powered Bay Curious stories have received 11 to 15 times more page views than other stories. Meanwhile, Matter Five company Metta has rebranded to Pie and raised a significant seed round from VCs in the Bay Area, LA, Tokyo, and Hong Kong. They’re primed to launch their 360 video platform on the App Store in mid-November. Matter Five’s Huzza, Mingyian, and Motherly have also received investment. Redivis is partnering with the Stanford Center for Population Health Sciences to develop an interdisciplinary and inter-institutional data collaboration platform. Our partners, and partnerships, have also flourished. In June, as we kicked off our Matter Six program and launched our new NYC office space, we were joined by a prestigious new media partner: The New York Times. The collaboration is being led by CTO Nick Rockwell, who seized the opportunity to join our parallel partner program as soon as he heard we were moving to NYC. In the spring, a number of New York Times staff joined representatives from The Associated Press, McClatchy, PRX, A.H. Belo, and Tribune Publishing, for a Matter design thinking bootcamp hosted by the AP. In total, 7 teams have gone through the program, which closely mirrors the experience of our entrepreneurs, and developed projects to spur internal innovation in their own companies. The program culminates in our first ever Partner Demo Day, also held at Google, NYC. Notable partner achievements this year include distinguished awards, namely a Pulitzer for The Associated Press for its Seafood from Slaves investigation. A Pulitzer also went to the McClatchy paper The Sacramento Bee. The LA Times, part of Tribune Publishing’s portfolio, won a Pulitzer for Breaking News for its coverage of the San Bernadino terrorist attack, while The New York Times’ Paris Bureau Chief, Alissa Rubin, picked up a Pulitzer for her reporting on women in Afghanistan. A. H. Belo’s flagship newspaper, The Dallas Morning News won 39 Texas APME Awards for journalistic excellence. Over at Google, which has given our NYC space an amazing feel with its sponsorship of the News Lab Mentorship Lounge and mural, our partner teams have been making huge strides forward. News Lab launched a Virtual Reality storytelling project, Journalism 360, in tandem with ONA and another of our foundational partners, The Knight Foundation. It also hosted a YouTube interview with President Obama. The zenith of Google for Entrepreneurs’ hectic year was its fourth annual Trailblazers summit, which brought together 50 partners from over 30 countries to learn from each other and work together to support startup communities. We’re really proud of KQED, our local partner in San Francisco, which this year launched its Lab, an intrapreneurial innovation-focused “Matter in a box” that culminated in five staff teams pitching at a Demo Day. Almost all of those projects, which spanned VR to culture tours, are still alive and evolving at the organization. Leaders Tim Olson and Colleen Wilson, who were trained by Matter’s Corey Ford, will be running a second installment of the Lab next year. PRX has also kicked off an amazing initiative based on our program: Project Catapult, a 20-week training course for public media radio stations which want to develop podcasts. In their own words, PRX will “apply an iterative process to show development in collaboration with the stations,” just as we do with our entrepreneurs. It’s been a wonderful year of innovation for PRX, which also opened The “Podcast Garage” in Boston, a co-working hub for local audio storytellers. Last but not least, another partner has joined the ranks. We recently welcomed Tamedia, our 12th partner, and our first based in Europe. Tamedia is Switzerland’s largest private media group and owns a number of major regional paid and free-sheet newspapers. It’s also active in Germany, Denmark, Luxembourg, and Austria. We’re excited to be partnering with such an established media brand, one that situates us in the heart of the European continent. To date, we have supported more than 100 entrepreneurs and 49 portfolio companies, and we are supported by 12 partners and more than 150 mentors in our turn. But this is only the beginning. As we move into 2017, we’re tentatively floating the idea of expanding to Europe or to another media hub of a different flavor, Los Angeles. In order to equip ourselves to expand our reach further, our priorities are hiring (we have openings in Program + Investments on both coasts), doubling down on our parallel program, encouraging more intrapreneurial innovation in the partners we serve, and establishing a steady state where we can accelerate two cohorts a year in both San Francisco and New York City. We’re on the frontier of the future of media, and it’s an exciting time to be part of our community. If you know of a startup that should apply to our program, point them to our website. If you’re an organization interested in partnering with us, get in touch.